I didn't have work Tuesday due to "shuubun no hi", which celebrates the autumnal equinox. There's something profound about holidays that correspond to the movements of celestial bodies. My leisurely day of meeting friends and cleaning my apartment probably doesn't have much meaning compared to such grand forces, but it was satisfying anyway. 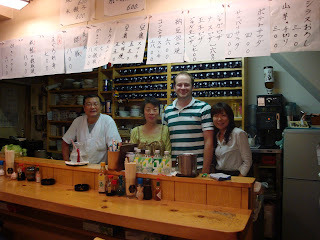 Yesterday I went to dinner with some people I know who work at the Ashikaga Board of Education. I like to eat with Japanese people because they always know all of the secret little places that I've never heard of and would never have found on my own. One thing that I will definitely miss when I return home is the unique dining. I don't know of many restaurants in Springfield in the middle of nowhere with only three tables, where the owner lives on the second floor. The meal began with what I refer to as "table food", as in, the simple act of me sitting at this table causes a small amount of food to be forced upon me. It bothers me on principle, because despite the fact that I didn't order this, I have to pay for it. Its one redeeming quality is that I get to try different foods that I would never order. 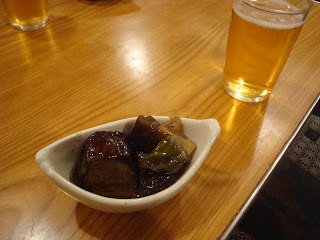 Today's no-choice-dish was sliced eggplant marinated in something sweet. Again, it was interesting, but never in a million would I ever order this willingly. 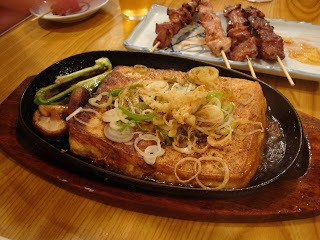 One thing that I had never had before was the tofu steak. It's not something pretending to be beef, but it was a bit tougher than the average tofu. It was served with mushrooms and peppers on the side, and piled on top was a vegetable mixture with a light sauce. Very good. You can see some yakitori hiding in the back. I wrote an explanation of that here if you missed it. I don't recall everywhere that this sauce ended up, but someone definitely put some on some fried oysters that we ate. 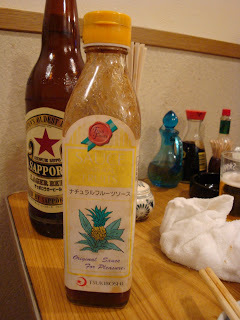 It seems to be pineapple based. I was just amused by the English writing on the label: "Original Sauce for Pleasure". Indeed. A worker from the city office is on my left, with the restaurant people on my right. The main reason I wanted a picture here was to point out the blue bottles covering the wall behind me. A common practice is for a customer to purchase and entire bottle of alcohol that they couldn't possibly finish. They then write their name on it, and the business keeps it for them until they next return, when they can drink more of their bottle. It seems like a deal that benefits the bar quite a lot and the customer only a little, but that's just me. Quite a few places in town do this, for obvious reasons. Your still going on dates with Maki?? That's disgraceful!! Your face is disgraceful. Arai sensei was there too. Did your hard drive arrive yet? Interesting about the bottles on the wall. I'll have to look for that the next time I visit Tochigi.